In Spanish, La Jolla means "the jewel," an apt name for a beautiful town ringed with blue waters. It's one of California's prettiest oceanside towns and home to several of the state's best beaches. You can plan your day trip or La Jolla weekend getaway using the resources below. Why Should You Go? Will You Like La Jolla? Get a Preview: Check out these 7 Gorgeous Reasons to Visit La Jolla. La Jolla is popular with shoppers, romantics and outdoor adventurers who can surf, kayak, scuba dive, and bicycle here. It's also a great foodie destination with some of San Diego's best-rated restaurants and an excellent place to go just to relax. The La Jolla Playhouse is well worth a trip if you like the theater. La Jolla and San Diego weather is good anytime, but it may be rainy in winter. If you're an active vacationer like me, don't miss a chance to do little or nothing for a change. A splendidly-beautiful La Jolla day is sure to drain all the busy out of your body. Beaches: When people say San Diego has great beaches, they mean La Jolla has great beaches. La Jolla Cove, La Jolla Shores, and Windansea are not only the best beaches in San Diego but perhaps the best in the state. Birch Aquarium: This small aquarium is packed with fascination creatures, and it won't wear you out. La Jolla Playhouse: This theatre company won a well-deserved Tony Award for Regional Theater in 1993. Shopping: Go for a window-shopping stroll along Prospect Avenue and the side streets that run into it. With few chain stores in sight, you might just find something you can't leave without. Walk Around: Do it yourself with this Self-Guided La Jolla Walking Tour. If you'd rather have someone else show you around instead, Where You Want to Be Tours visits five art galleries, the La Jolla waterfront, a hidden mermaid statue and the Sunny Jim sea cave. Go Kayaking: Hike Bike Kayak offers a tour of the La Jolla Sea Caves, and no experience is required. Bike and Kayak Tours offer both guided tours and kayak rentals. 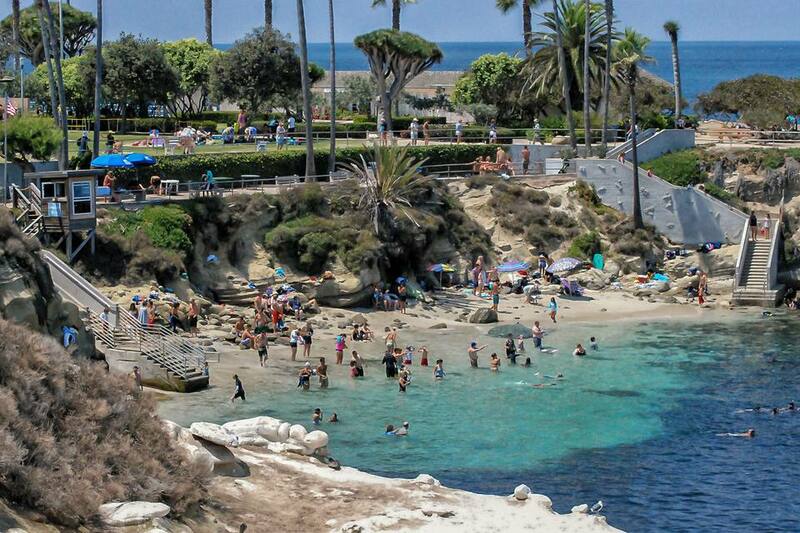 La Jolla is busier on weekends than during the week. If you can visit Monday through Thursday, you'll almost have the place to yourself. To enjoy La Jolla at its scenic best, check the low tide times before you go. Head for La Jolla Shores as the tide is going out and visit La Jolla Cove at low tide when the tide pools are revealed. The visit to Sunny Jim Cave is only marginally interesting, and the 145 stairs are a bit of a climb if you aren't in shape. La Jolla is home to some top-notch restaurants, and many of them serve their excellent cuisine at lunch, but at a lower price than at night. George's at the Cove is an especially good place to use this strategy, since you can see the ocean from their windows better in the daytime, anyway. It's harder to find a parking spot in La Jolla on a weekend than it is to find gold on the beach. If you're there for the day, you've gotta find someplace to park your ride. These tips might help. There are no parking meters, but parking enforcement is active in La Jolla even off-season. Streets nearest the water have a one-hour time limit. Go a little further away for two-hour parking. You'll find a few paid lots scattered around town. The ones on the edge of downtown charge less than ones closer to i. Your best bet may be a parking lot so hidden that few people notice it. Turn downhill onto Coast Blvd. from Prospect, and you'll find it on the left, across from the Cave Store. Vehicles more than 6'5" won't fit in it, though. The Cottage serves fresh cuisine in beach bungalow atmosphere, and The Marine Room at La Jolla Shores has been voted the area's best Sunday brunch. For a simple breakfast, few tourists and terrific views, follow Coast Blvd. to the Goldfish Point Cafe. For dinner, you won't find a better meal than at Nine-Ten restaurant. The Los Angeles Times calls it a "serendipitous discovery." Others just say an enthusiastic: "Yum!" to everything they try. Mid-day, a table on the sidewalk is fun for people-watching, but in the evening, their back patio is super-romantic. George's at the Cove is a long-time La Jolla favorite that has been voted best restaurant in San Diego more than once. If your budget allows, choose a place in the village, close enough to things that you can walk. You'll have more fun if you aren't worried about finding a parking spot or fretting that you're overstaying your time limit. Use the guide to finding a La Jolla hotel for more tips about where to stay.